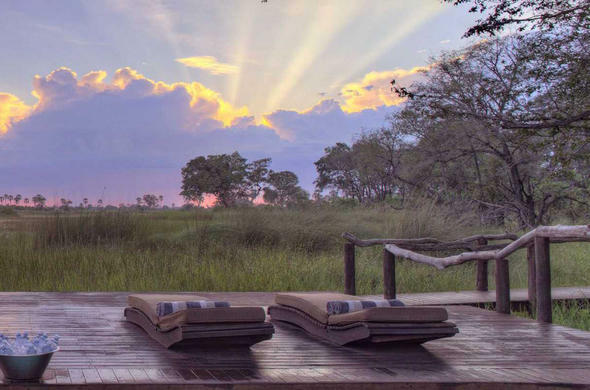 The Nxabega Concession is a small area right in the heart of the Okavango Delta and has stunning open floodplains where you can see Lechwe and even Giraffe on your Okavango safari. You can enjoy a number or exciting water excursions in this concession. The Nxabega area is located in the middle of the south western areas of the Delta. This small concession has many different habitats and a wide variety of species. There are several camps and Okavango safari lodges in this area, managed by different companies, so you will have a choice of safari accommodation. Lion and Hyenas are often seen. Leopards are common in the riparian forest and the best time to see them is on a night game drive or early morning game drive. Wild Dogs occasionally pass through the reserve - always a fantastic sight. Black backed and Side Striped Jackals are common in the concession. With it varied habitats the Nxabega Concession supports a wide variety of birdlife. In the areas of permanent floodplains around Kanana you'll see Squacco Herons, Yellow billed, Marabou and Open billed Storks, Cormorants and Egrets - including Black Egrets and Slaty Egrets. You may see Black Crakes as well as nesting Bee-Eaters and many different species of Kingfishers. Raptors are well represented in the drier regions of the concession and you may see Tawny, Bateleur, Martial and Wahlberg's Eagles. To stay at camps in this area you have to book in advance and fly into the camps private airstrip.